Do people even watch the Smurfs anymore? 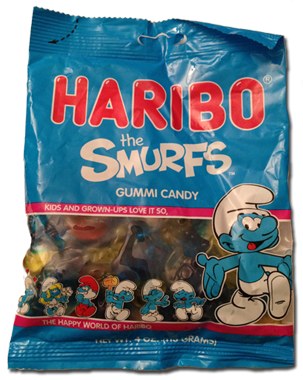 Well Haribo sure is hoping they do, as they just released their Euro-favorite Smurf gummies in the US, just in time (ok, a few months ahead) of the summer release of Smurfs #2 coming this July. Maybe I’m the wrong guy to do this review. For one, I love Haribo. And I don’t just love it, I think about it in ways that aren’t legal for me to write about. For two, I ate the bag way too goddamned fast. I was watching Austin and Ally with the kids and I was eating while writing and I went from nibbling to gobbling the whole bag to help cure the boredom, and well, you know how that goes: the food is suddenly gone and I’m fat as hell. But let’s give it a go anyhoo, yes? But these have the great Haribo chew I love as well as an overall fruit flavor that comes through tarty and citrusy. These aren’t sour, but I like the lemon undertones espesh when Haribo isn’t calling them “sour”. Good on them. Look, Haribo gets 4 stars almost any day by just adding their name to a product. 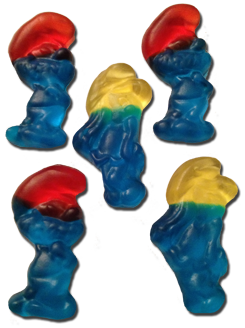 But these things have what I’ve come to expect and Love in Haribo candy: great flavors, fantastic gummy, and fun! litlol. no. really. i’ll try not to be too mad that you didn’t save any for me. they went so fast, bangsy! You happen to know why these are different from the German version? I wish I knew things like that. I’m guessing that the US FDA has certain laws and regs on ingredients and dyes and that the German version doesn’t have the same. But that’s just my theory.